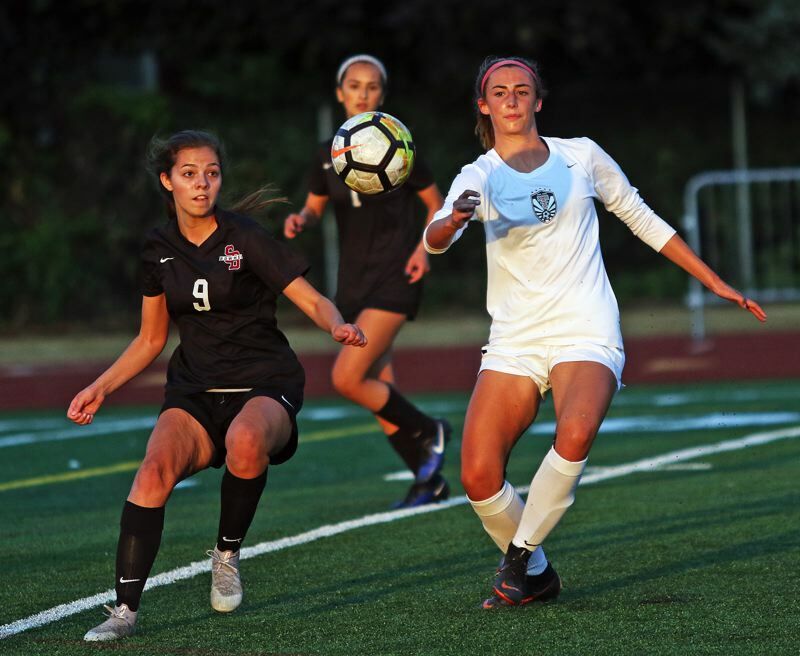 SHERWOOD — The last time the Sherwood and Tualatin high school girls soccer teams faced off, a lot was on the line. It was the second round of the 2017 Class 6A state playoffs, and the Timberwolves came away with a 4-2 win on Sherwood's home field. That setback was still fresh in the Lady Bowmen's minds when the two talented squads met up again. And that motivation seemed to power the Sherwood squad. 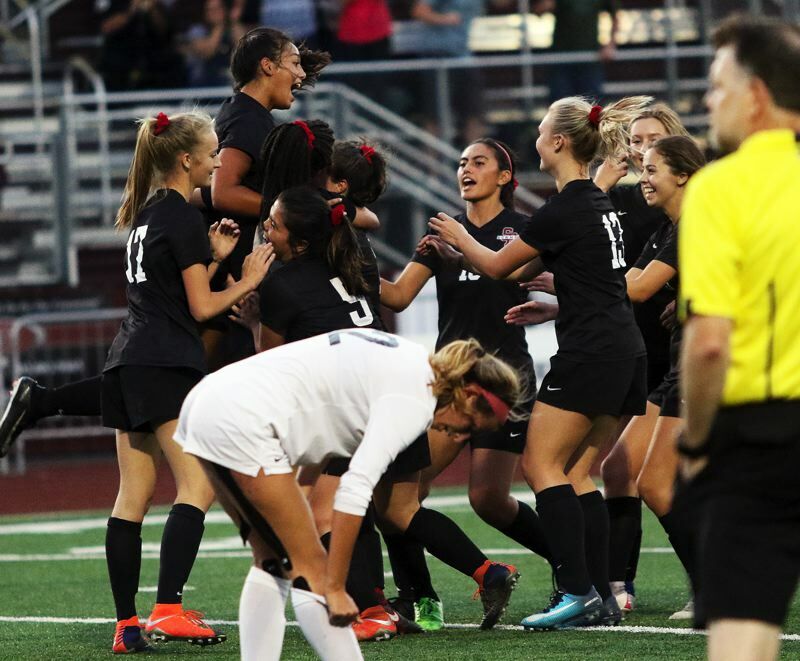 The Lady Bowmen came out on top in the rematch, fighting off Tualatin to get a 4-3 victory in a non-league contest played last Thursday at Sherwood High School. "It's a pretty big win. 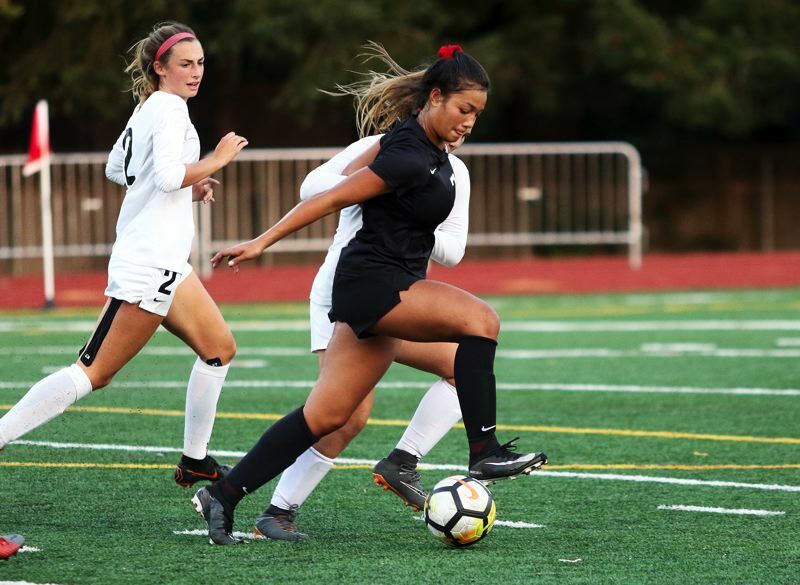 Last year, we beat them during league, but they beat us in the playoffs," said Sherwood junior forward Loma McNeese, who scored a goal in last Thursday's match. "That was pretty devastating. This was kind of like a revenge game, and I think we showed ourselves." "After losing to them on our home pitch, we never wanted that to happen again," Sherwood junior defender Jillian Leroux said. "We came out stronger this time." With the victory, Sherwood improved to 3-1 on the season to that point. "Oh, I think we're going to go so far," Leroux said. "If we keep this energy up, and have this drive, we're going to do great things." Tualatin moved to 1-1 on the season, to that point, with the setback. "We definitely tried to fight hard, and we knew that Sherwood was going to come out strong," Tualatin sophomore forward Cally Togiai said. "But, this is just our second game, and it's their fourth game, and we're still trying to figure things out. But it went well." Defenses controlled play in the first half of the showdown, with the teams battling through a scoreless tie throughout most of the first 40 minutes. 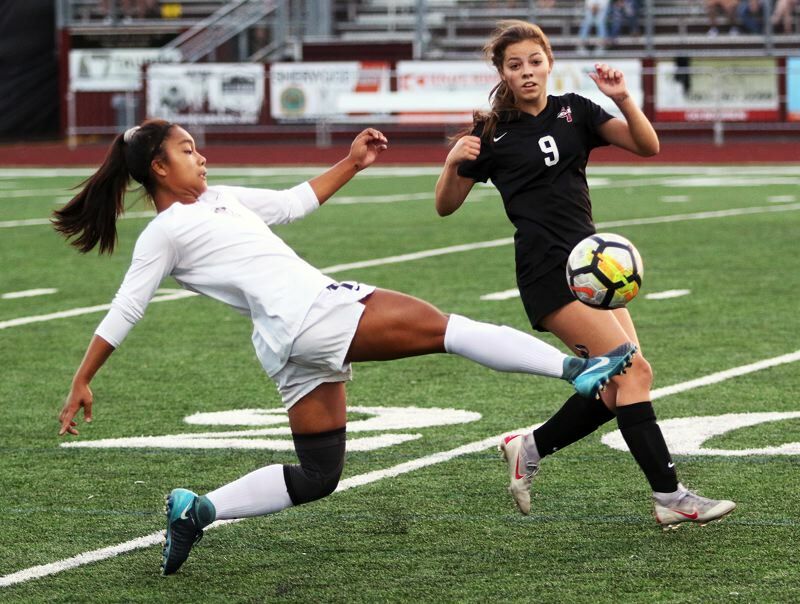 Tualatin, in the first half, got shots on goal by sophomore Alyvia Embree and Togiai, but Sherwood freshman goalkeeper Tali Kozma made saves on both of those attempts. Timberwolf freshman Brook Burke came close to breaking the scoreless tie when, with 9 minutes and 25 seconds left in the first half, she had a shot from 20 yards out hit the crossbar of the Sherwood goal. 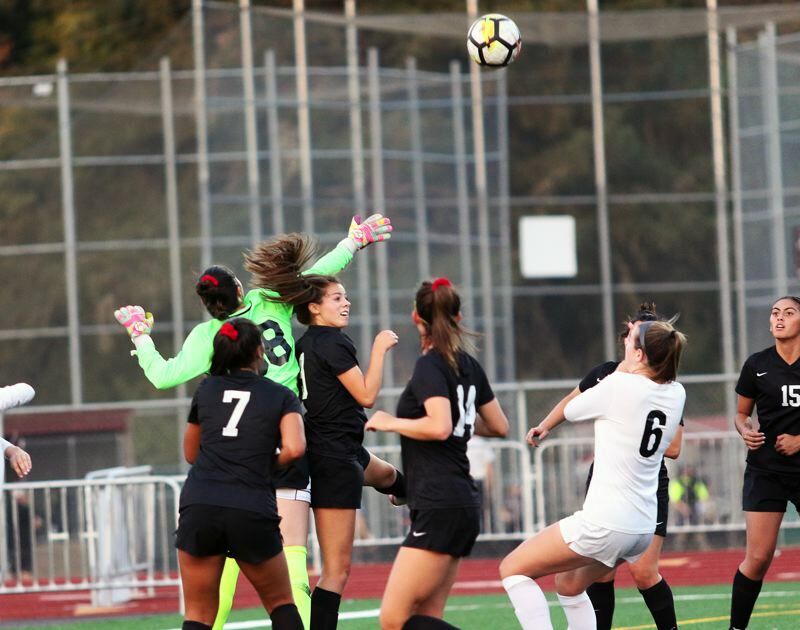 Meanwhile, on the other side of the field, Sherwood got three shots on goal from McNeese, two by sophomore Kendall Mickelson and one by Leroux, but Tualatin junior goalkeeper Sarah Hall, diving, running and leaping, made spectacular save after spectacular save to keep the shutout intact. 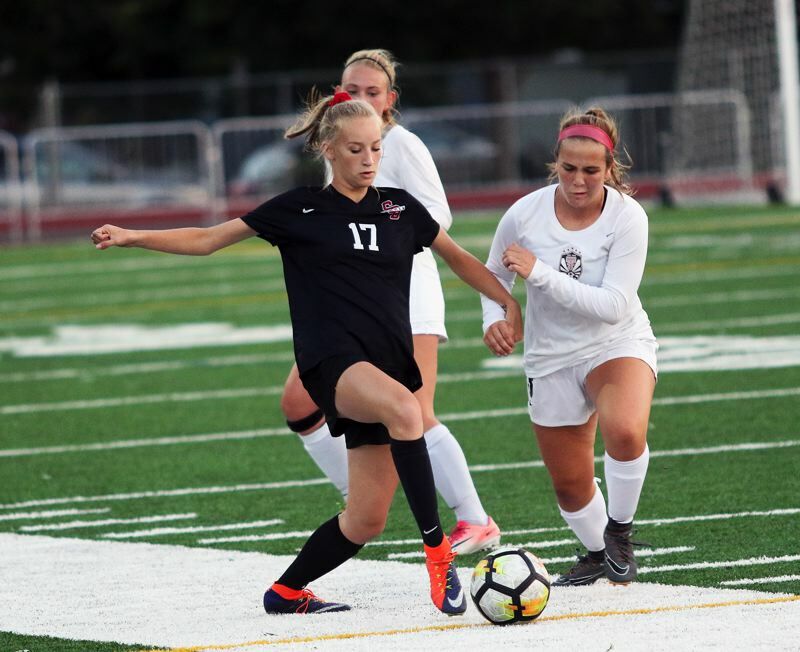 Hall, sprinting out from the goal, made a running block of a shot by Mickelson, but Lady Bowmen sophomore Kylah Williams, getting to the loose ball, smacked a follow-up shot from 22 yards out into the Tualatin goal, giving Sherwood a 1-0 lead with 1:09 remaining in the first half. 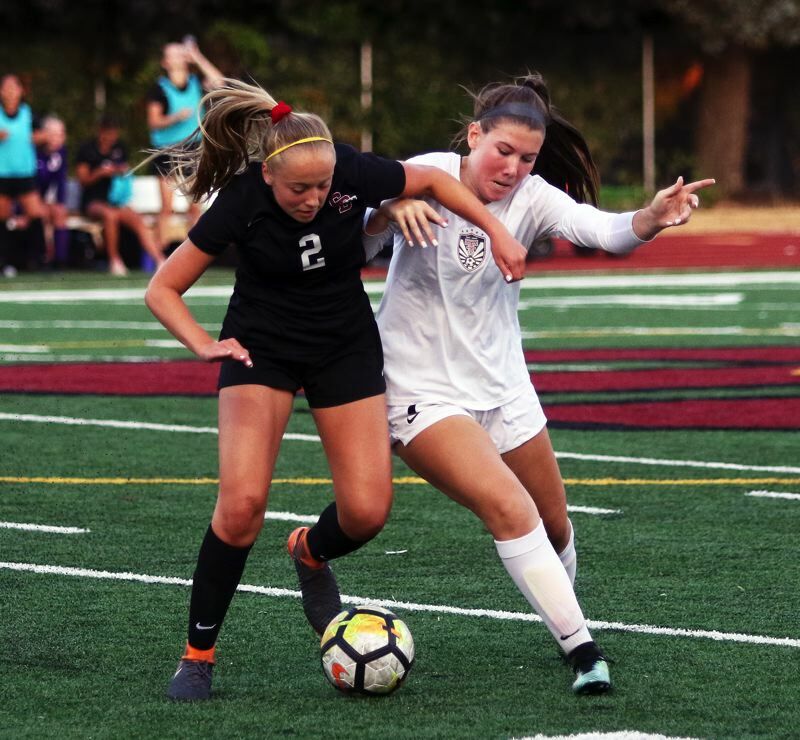 Tualatin, trying to battle back, tied the match at 1-1 when Embree scored on a shot from 20 yards out, driving the ball just inside the right post of the Sherwood goal with 32:30 remaining in the second half. But it didn't take the Lady Bowmen long to answer back. Just seven seconds after the ensuing kickoff, McNeese scored on a shot from 18 yards away, putting her attempt just inside the right post of the Tualatin goal, giving Sherwood a 2-1 lead with 32:23 left in the match. "It was hard, after they scored on us," McNeese said. "It was hard to see that happen, so we wanted to give them another shot." 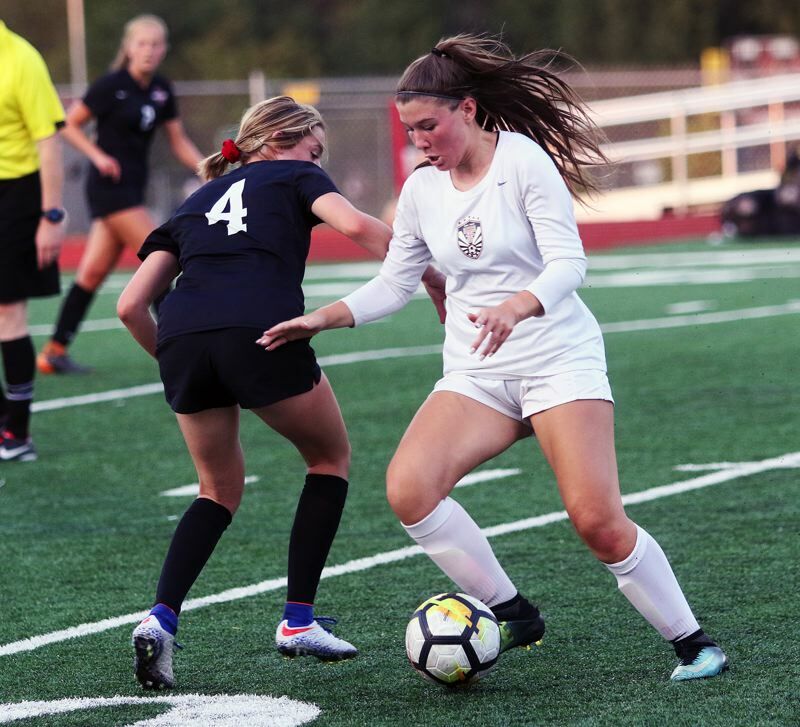 Sherwood upped the margin to 3-1 with 20:07 left to play when freshman Ellie Schmidt scored on an attempt from the right side, hitting a lofting shot that drifted just over Hall's reach and sailed just under the crossbar of the Tualatin goal. The Wolves' still fighting, trimmed the margin to 3-2 when Burke knocked a loose ball into Sherwood goal from close range with 9:01 left to play. But, again, Sherwood quickly answered back. This time, it was Mickelson scoring on a rebound shot, after another diving block by Hall, upping the lead to 4-2 with 7:03 remaining. "Everyone wanted that so bad," Leroux said. "You can't let your heads get down. You have to come back strong, and that's what we did. That's why we won this game. We came out stronger after they scored." Togiai scored on a spin-around shot with 14 seconds remaining to make the final tally 4-3. "We had a lot of chances, with everyone," Togiai said. "I figured there wasn't much time left, and we didn't want to give up." But it was Sherwood celebrating as the match went final. "We remembered how we felt last time we played them," McNeese said. "And (Sherwood coach Katie) Hartman always says to keep a picture in the back of your head of that moment, and we did. We never want to feel that way again." Sherwood had 13 shots on goal and two corner kicks in the contest. Tualatin had nine shots on goal and one corner kick. "It was intense. Sherwood really wanted it, but we just have to regroup and get back together," Togiai said. "We learned a lot of things, having to work on the fly, and stuff, but we'll definitely come out stronger. It was definitely fun. There's a little rivalry between us, its fun." Both teams will be back in action on Tuesday. Tualatin will host Sandy and Sherwood will play at Camas, Wash.